Be the first to share your favorite memory, photo or story of Jenny. This memorial page is dedicated for family, friends and future generations to celebrate the life of their loved one. 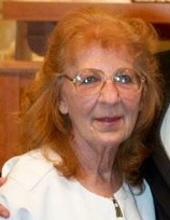 Jenny F. Diederich, 79 of Mendota passed away January 13, 2019 in the Mendota Lutheran Home after a brief illness. Visitation will be Saturday, January 19, 2019 from 9:30 until 11:30 in Schwarz Funeral Home. Services will be at 11:30 in the funeral home, with Vitas Chaplain Richard Hillenbrand officiating. Burial will follow in the Lutheran Cemetery. Jenny was born September 27, 1939 in Chicago, Illinois to Frank and Libby (Tichy) Schorik. During her work career she was an Auditor at Copley Hospital for 15 years, then in the area she was in sales with the Mendota Reporter, and utilizing her love of meeting and talking with people, she was a Merchandiser for several area stores. Survivors include: two daughters; Lori Wolgast and Gail (John) Collins both of Paw Paw; 7 grandchildren: Michelle (James Shank) Collins, John ( Lauren) Collins, Ryan Collins, Tyler (Azeriah Valdez) Collins, Adam (Kim) Wolgast, Matthew (Jamie) Wolgast, Leanne (Chase) Sellers; 11 great grandchildren: Trinity DePola, Zoey Shank, Deona, Farrah, Griffin and Lauretta Collins, Aiden and Blake Wolgast, Paytan Wolgast, Cainan and Brody Sellers; and one brother: Frank (Carol) Schorik of Bennett, Wis.
Jenny is preceded in death by her parents and 2 brothers: Donald Schorik and Richard Schorik. Pallbearers will be: John, Ryan and Tyler Collins, Adam and Matt Wolgast and Chase Sellers. Memorials May be directed to: The Closet @ 2026 N. Main Street Princeton, Illinois 61352. To send flowers or a remembrance gift to the family of Jenny F. Diederich, please visit our Tribute Store. "Email Address" would like to share the life celebration of Jenny F. Diederich. Click on the "link" to go to share a favorite memory or leave a condolence message for the family.